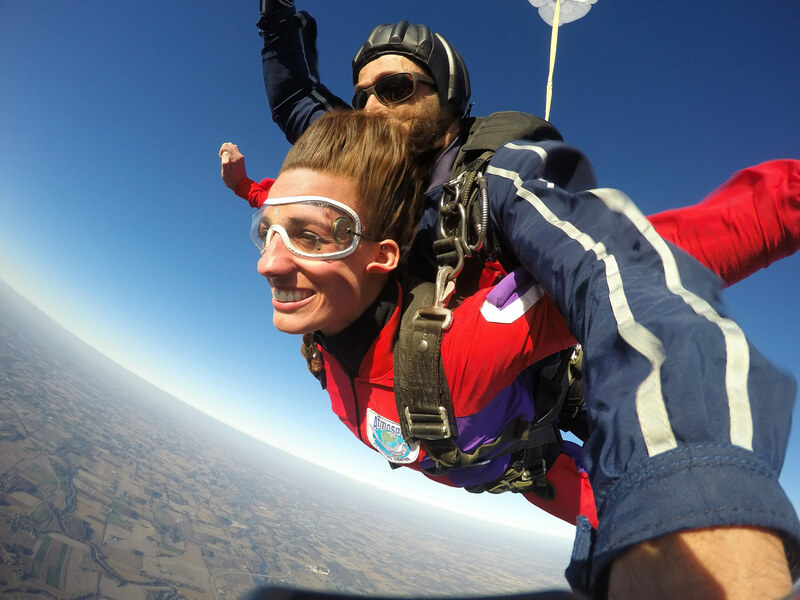 When Jenny Rogers did her first tandem jump at Wisconsin Skydiving Center in 2004, she had no clue how much it would change the trajectory of her life. 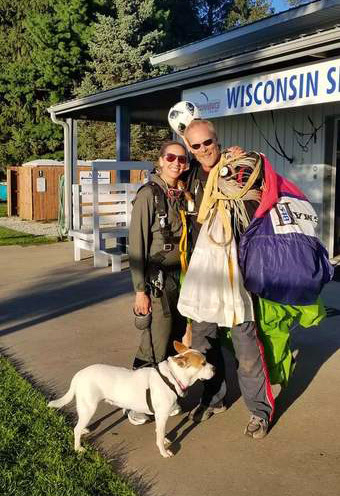 Though as destiny sometimes wills it, on that momentous skydive, she met tandem instructor Charlie Rogers for the first time. 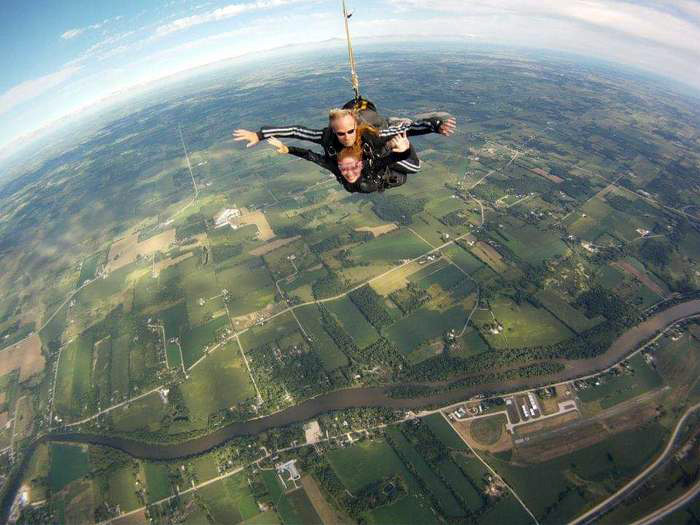 Jenny was actually doing that tandem skydive not alone – she was accompanied by her fiancee at the time. As fate would have it, however, she found herself single not too many months later – and kept thinking about that handsome skydiving guy, Charlie. They dated for a short while in 2005, and then Jenny found she needed to “tidy up some drama” in her life. A few years later though, Charlie and Jenny went on a trip to Hawaii as friends. They came home admitting to being a solid couple. In 2013, they took the plunge into married life and have since continued their journey with heaps of adventure – and the inevitable struggles that accompany balancing work and skydiving. When you spend time talking with Jenny and Charlie, it is apparent the honeymoon is not over. They love being married and working as a team, balancing their various passions with their regular weekday jobs. Jenny has been a programmer with Frontier Communications for 20 years. Charlie works for the city and if you have read his bio, you know he is the most hated man in town. Writing parking tickets and working for the city government can have some harsh downsides, and Jenny says his weekends at the dropzone are the balance he needs. Charlie was at first not keen about fostering a dog. Not surprisingly though, the word “adoption” was on his lips within short order. When he found out they might not be automatically approved to adopt Bella, there was discussion about a hasty escape to Mexico. Luckily, it all worked out in the end. Bella stole their hearts, and being a mutt mix, they often fondly refer to as an AmBosChowBox. Two years ago their fur baby was diagnosed with an aggressive blood cancer. Bella has defied the odds however and far outlived her prognosis. Woof! Jenny Rogers had no idea how much love, joy, and adventure that single tandem jump decades ago would bring into her life. Sharing a life with a partner so passionate about giving back and being positive has made for a beautiful journey together. Love wins, and we wish nothing but Blue Skies for Jenny and Charlie.